Learn how to fix bricked Micromax Canvas Evok E483 by flashing stock ROM/firmware in it, if you also have a Micromax Canvas Evok E483 and you are facing any problem like your Micromax Canvas Evok E483 is bricked or it has stuck on its logo or its showing blank out screen only or if you want to unroot your phone, or your Micromax Canvas Evok E483 is not starting then you can get here all in one complete solutions for your Micromax Canvas Evok E483, you will learn here how to fix bricked Micromax Canvas Evok E483 by flashing stock rom/firmware using Sp Flash Tool also download stock rom/firmware for your Micromax Canvas Evok E483. If you don’t have a backup of your stock rom and you’ve already installed a custom ROM or custom recovery, and you want to revert it back into its original condition then simply flash Stock ROM/Firmware using Sp flash tool. According to me flashing Stock ROM in any android device is a best trick to take come-back that android again in its original condition, which make feels you like you’ve purchased your phone just after flashing stock ROM, and the best advantage of that if you have rooted your android phone then its common you had lost your warranty, and after flashing stock ROM you will get your phone’s warranty back officially. Warning: This tutorial is only for Micromax Canvas Evok E483, don’t try this tutorial for flashing Stock ROM in other android phones. Make a full backup of of your internal storage because flashing stock ROM using Sp flash tool will erase all of your internal storage and data from your device. 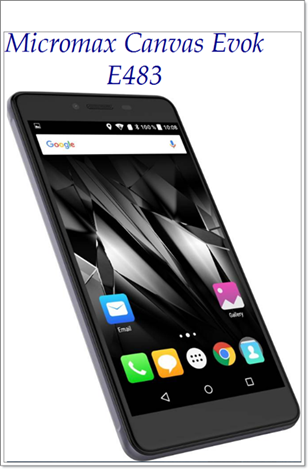 Download- Stock ROM/Firmware for your Micromax Canvas Evok E483. Download- Mediatek Drivers (its very important so first install it before flashing process). Make sure you have successfully installed mediatek drivers in your Laptop or PC, Mediatek drivers are most important thing that many users avoid and failed to flash stock ROM using Sp flash tool. You need to Extract/Unzip all these above files (Downoads) with 7zip or winrar or any other software, before flashing stock ROM/Firmware using Sp flash tool. After successfully flashing, you can properly see a popup message in green circle “Download ok” thats it! you’re all done! now you can remove your Micromax Canvas Evok E483 from PC and switch on your phone normally, in first time it will take some time about 7-10 minutes don’t panic its normal process, so wait until up to at least 10 minutes, if your phone still not starts then check and try again this whole process, Good Luck! If you have not followed above steps carefully. Note- Flashing stock ROM using Sp flash tool might bricks your phone, so do at your own risk! I’ll be not responsible for your soft-bricked phone. The above tutorial was about how to fix bricked Micromax Canvas Evok E483/unroot/flash Stock ROM/Firmware using Sp flash tool, you can also download stock firmware for your phone from here, hope this tutorial helps you to fix your android phone. subscribe this blog (https://www.techinvade.com) to get awesome updates about technology and androids. Download Stock Rom for micromax canvas evok E483, how to Flash Stock Firmware in Micromax Canvas Evok E483, Flash Stock Rom In Micromax Canvas Evok E483 using Sp Flash Tool, Fix my Canvas Evok Flashing Stock Firmware, Download Stock ROM/Firmware for Free. Thank you very much for letting me that my link is not working, now I’ve updated the link. You can download your firmware for your micromax Canvas Evok E483.